Happy Monday everyone, I hope you all had amazing weekends! I spent this past weekend attending a super fun blog event and starting to organize for my trip to LA (which is now less than a month away!!). While I'm still debating outfits, one thing I know for sure is that I will be working on getting a perfect glow for the trip. 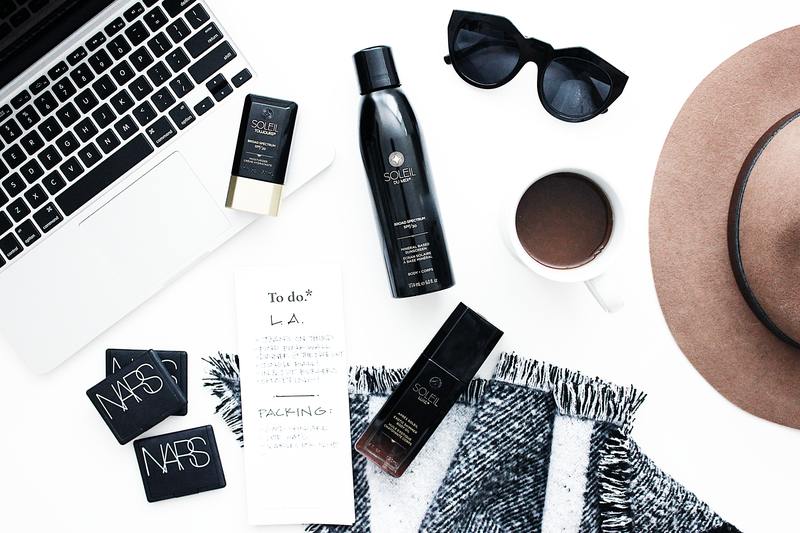 I plan to (fake) tan pre-LA, but I know for sure I'll be packing a few essentials to help keep my skin glowing as well as protected while I'm out in the warmer weather. This is where Soleil Toujours enters the picture. Soleil Toujours is a brand that focuses on providing users with a suncare product that is clean from harmful ingredients (such parabens, oxybenzone, and other chemicals/toxins), filled with skin nourishing/anti-aging ingredients, all while being luxurious. Not only are they packaged beautifully, they also work beautifully as well. The number one thing I'll be bringing with me is the Broad Spectrum SP 20 Moisturizer. This is the perfect product for keeping skin hydrated but also protected (it's also travel size friendly). I'll be throwing this on pre-flight (with no makeup) as well as using it under my makeup while I'm there. Since we will be out and about in the sun this is definitely necessary. I also really appreciate this product because I am someone who's skin totally suffers from putting regular sunscreen on my face. So I love that this product is specifically geared for your face and filled with nourishing ingredients. It has a light scent, but fresh and leaves your skin hydrated but not greasy. The perfect combination. I'm also a big fan of the Mineral Based Sunscreen (SPF 30). One of the biggest perks for me is the face that it is a spray formula which is so much easier to apply. It also comes out white (which means you can see where it is going and you won't miss any spots) and blends in easily. It also has a light scent, but nothing over powering. Last, but not least is the Après Soleil Body Oil. My favorite for nighttime use. The oil leaves behind a really gorgeous shimmer/sheen, has a bit of a bronze coloring to it, and enhances a tan beautifully. It keeps the skin hydrated but like the other products doesn't leave behind a greasy feel. It also dries down quickly, a huge must for me. This one has a bit more of a scent due to it's ingredients which include; Rosehip seed oil which helps to regenerate skin and reduce scars, Argan Oil, Green Tea leaf extract, Pomegranate seed oil which has anti-oxidant effects, and Rosemary leaf extract which helps with age spots and tones/tightens. What are some of your favorite skincare/suncare products? Have you tried anything from Soleil Toujours before? *This post has kindly been sponsored by Soleil Toujour - however all opinions/views are my own. I only promote and post about products I have used/would recommend.